Members of the 3rd class of the AMP are posing for a portrait at the commencement ceremony, held on June 29th, 2016. Recognizing outstanding achievement at 2016 AMP commencement awards ceremony. 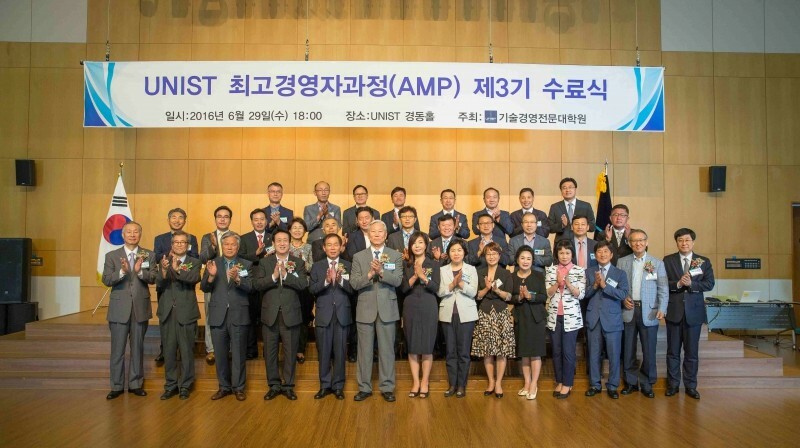 On June 29, 2016, 32 members of the 3rd class of the Advanced Management Program (AMP) received AMP graduate certificates after the completion of the 2016 AMP program at UNIST. The ceremony featured the conferral of degrees, followed by the awarding of honorary degrees, greetings and remarks by Director JaeSuk Seo (Ulsan Branch of Gyeongnam Bank) and City Council BokGuem Jung (Ulsan Buk-gu office), as well as “A Conversation with President Mooyoung Jung of UNIST”. The Advanced Management Program (AMP) at UNIST is a highly interactive, student-centered educational experience in which leadership skills and abilities are emphasized. The program offers an innovative and continually updated curriculum for senior executives who strive for excellence and are serious about taking their organizations—and themselves—to the next level through innovative leadership.